I extend my good wishes to all the devotees of Sathya Sai, to my friends, sisters and brothers, and all respected elders on this auspicious occasion. This is the first birth anniversary of Bhagawan Baba, celebrated today without His physical presence. Even though He is physically not present amidst us, spiritually He is residing in all our hearts in full measure. Those who wish to see Him and crave to listen to His voice, He always makes it possible. However those who think otherwise, they are wasting their time as Bhagawan will never appear to them. 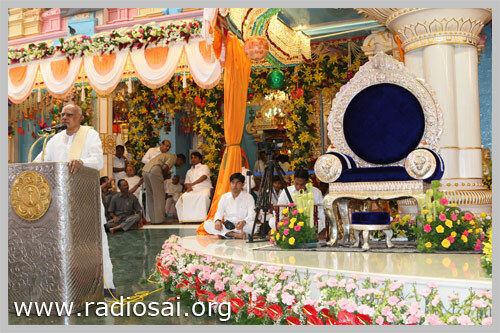 Today Puttaparthi is transforming itself into a pilgrimage centre. This is because Bhagawan has taken birth here; such is the sanctity of this place. From the scriptures we know of the birth place of Sri Krishna to be Mathura; we go there, see and feel ecstatic. In the same way, scriptures declare Ayodhya to be the birth place of Sri Rama. Even now people go to Ayodhya with yearning in their hearts and return with a new experience. 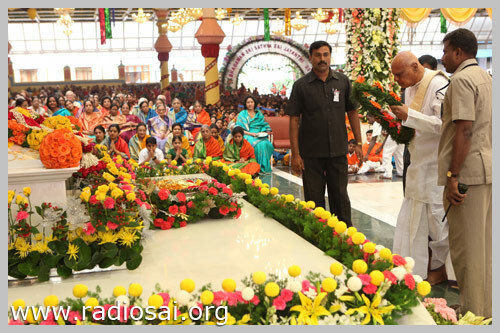 In the same way Puttaparthi, the birth place of Sai Bhagawan, is so sacred for all of us. This land is so holy as God was born here, moved amidst us and granted His Divine Darshan to all of us. Without desiring anything for Himself, He wished that the entire mankind should live in harmony and happiness. On my part, I always feel that I am very fortunate not because I became a minister, Chief Minister or Governor, but because I have been in the vicinity of Bhagawan’s grace, and am one among the millions of Swami’s devotees. Bhagawan used to affectionately call all of us, “Bangaaru”. Today we are deprived of that, but if you can touch your inner consciousness and think for a while, you can still hear such a lullabical sound incessantly ringing in your ears. Such is the greatness of Bhagawan. In Puranic age also, there were many who criticized and in fact, suspected the existence of Divinity. We need not care for them. Let us accept the good wherever it is. We need not consider the other aspects which are trivial and trash. Some people still wonder whether Sai is Bhagawan or not. These words have no relevance. Keeping Puttaparthi as the centre for His activity Bhagawan wished that the State, the Nation, and also all other countries should receive the seva activities with equality. This is possible only because Swami is God. Let us move forward with the same belief and engage in good activities. While walking the well-lit path as shown by Bhagawan, let us redeem ourselves and strive hard for the uplift of society. I appeal to all of you in all humility that I will also participate along with all of you in carrying out the seva activities. I feel immense pleasure in listening to good words during this celebrations and take leave of you with utmost happiness in my heart.